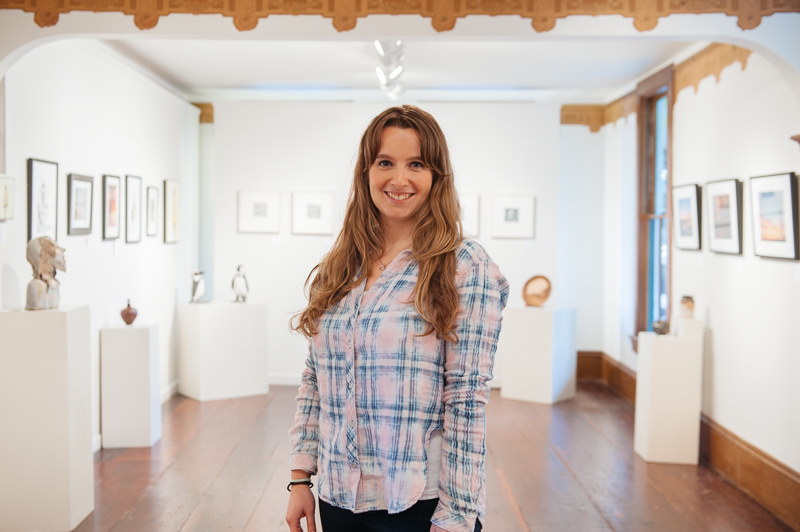 We recently spent the afternoon with Natalie Ciccoricco, a Dutch artist and illustrator, who is part of The Main Gallery in Redwood City. The gallery is a co-op, that is currently home to 15 amazing artists with work ranging from painting, to photography, to sculpture, to collage. It is housed in the historic Offerman House, which is the oldest surviving building in downtown and was recently placed on the National Register of Historic Places. The building was recently sold and the gallery may be looking for a new space to call home at the end of the year. They are also currently accepting new artists. Natalie's work is surreal and dreamy, yet fresh and modern. We got to chat about her artwork and her inspiration, as well as moving to California and house hunting on the Peninsula. Can you tell us a little about your artwork? Can you tell us about the Main Gallery? And the Winter Light show? The Main Gallery is a cooperative gallery, with around 15 members at the moment. We all pay monthly dues and staff the gallery. We also help with installations and marketing and various things. Everyone has their own tasks and obligations. I was surprised to see how well everyone’s work came together with the theme of Winter Light. It all fits so nicely with all the colors and everything. I joined the gallery during the last holiday show, and this is the first show where I’m really sharing more of my work. I started making my collages just over a year ago and now it’s gotten to the point where I’m not just keeping these for myself, but I’m putting them out there. It is a bit nerve wracking. It’s scary to take that step, but it’s been great so far. When you get feedback from people who actually like your stuff, it’s very encouraging. You recently had a piece selected for a show at Yosemite National Park. Can you tell us a little about that and your inspiration for that series? I went to Yosemite for the first time last April with my parents. It’s a very inspiring place. It was so gorgeous. We drove up there and it was all sunny and warm and it was getting later in the day, so we decided to go to the cabin and explore the next day. And then the next morning we got up to go on a big hike, and we looked out the window, and it was completely white. There was fog and snow! So we drove to this viewpoint very carefully—the one spot you can see the whole park—and we couldn’t see anything. Luckily, the next day we went on a beautiful hike at the falls. A couple months later I was on the website and saw there was a call for artists for a juried exhibit and I thought it would be neat to enter. I pulled inspiration from that trip to recreate the landscapes with postcards and embroidery thread. I had a piece that was selected and will be showing from the end of February to April. I’m really excited about it. You also recently started doing more illustration work? In June, my husband and I took a sabbatical and drove to Sequoia National Park, Joshua Tree, Palm Springs, San Diego, and back. While we were on the road, I started making sketches and illustrations. I’m not selling them at the gallery right now because all the originals are in my journals. I did put together a set of postcards with illustrations on them. I also sell prints online on Society 6, so you can get pillows, tshirts, mugs, clocks, anything really. I’m thinking about pursuing more illustration work. I’m trying to figure out what I want to do and where I want to be with my art. So far, it’s been pretty organic. I would love to do more commissioned work, and stuff like that. I recently did some work for a startup called Pozvat. They are an online invitation website and are launching soon. That was a lot of fun. I also did some toy designs for Little Sapling Toys. They make such beautiful toys. What other kinds of things inspire you? Everything from film to other artists to music. I studied art in college including art history, literature, a lot of film history. I’m a big film fan. I like old movies, Hitchcock, and film noir. I also like more modern stuff like Quentin Tarantino and David Lynch. Sometimes I like to draw from there for some darker, surreal stuff. I’m also inspired by books by the writer Haruki Murakami. They’re also very dreamy and surreal. I like to work with music in the background: anything from Neil Young, to David Bowie, to the Beatles. I have a website and I plan on setting up a little online shop there in the near future. At the moment, I’m selling through Society 6, Saatchi Art, and a couple of other online galleries called Creative Debuts and Sold Story. I’m also one of the launch partners with Maad Art. What I like most though is having my stuff on the wall here at the gallery. The problem with selling online, especially with collage is that it doesn’t always translate well. You don’t see the texture and the shimmer of the embroidery thread, when it’s on the screen. I hope that people will come in here and see the actual works. I feel the same about the paintings here. There is so much texture, you miss something when it’s just a flat image on the screen. So you’re originally from the Netherlands? How long have you been living in California? I have been in California for three and a half years now, since 2012. I got married the year before, in the Netherlands, but my husband is American. He is originally from the East Coast, from New Jersey, and he works for Electronic Arts. I also used to work for them, but in the Dutch office. We met nine and a half years ago when I was working on a project here in California. We fell in love, had a long-term relationship, and then got married. I was waiting for a visa, so I was in Amsterdam until all the paperwork was done. He was living in Redwood City in an apartment and I moved in with him, and then we bought a house in San Carlos. I’m still in Redwood City all the time, at the gallery, and I practice ballet here. Are there things that remind you of where you grew up in Holland? Or things that are totally different? It’s mostly different from where I grew up. I grew up in a rural, small town. Holland is small though, so if you’re in a rural area, within 15 minutes you’ll be in some kind of city. When I first moved here, I really missed the old buildings and the cultural history. That’s one of the things I liked about the Main Gallery and Alana’s next door. If you open your eyes and look a little harder you will find older buildings. And then you realize that even before Europeans got here, there is a very rich history of Native American culture, and you can search for that. So the cultural history is here as well, but it took me a while to realize that. In Holland, I lived in places that were built in the 1600 and 1700’s. I think it’s funny when I watch TV here and they have the Ghost Hunters saying, “This building is 100 years old, so it must be haunted.” Every building I lived in was older than that, and I don’t think any of them were haunted! I was pleasantly surprised when I visited the East Coast and saw the buildings in Brooklyn and New York. They have that feeling like they have been around for awhile. You mentioned that you bought a house in San Carlos. What was your house hunting experience like? It was challenging. We looked at plenty of houses, both in Redwood City and San Carlos, even in San Mateo and Belmont. We really wanted something unique, but affordable. We are very happy with the house we ended up with. It’s in the San Carlos hills. There are deer and raccoons, we can see the Bay Bridge from our deck, and we have a bunch of really big oak trees. I just love it here. Every morning when I get up, I feel like we’re in a cabin in the woods, but we’re still so close to everything. Where are your favorite places to hang out in Redwood City? Here at the gallery! And Alana’s next door. I spend a lot of time at theAcademy of American Ballet on Middlefield Road. If I’m not making art or working, I’m there taking ballet classes. They have a ton of classes for adults, both ballet and modern. I love the movie theater, Tartine, Bliss Coffee, Philz. We recently went to Timber & Salt and really liked it. And I love Martin’s West. They had a Belgian beer on the menu from this very small monastery close to where I grew up. My parents still live there and it’s so close to Belgium that you could walk across the border. There is this tiny little monastery where they make beer, and they had it on the menu a couple years ago. I was like, Wow! They know what they are doing! They’re not just driving to Costco for beer.